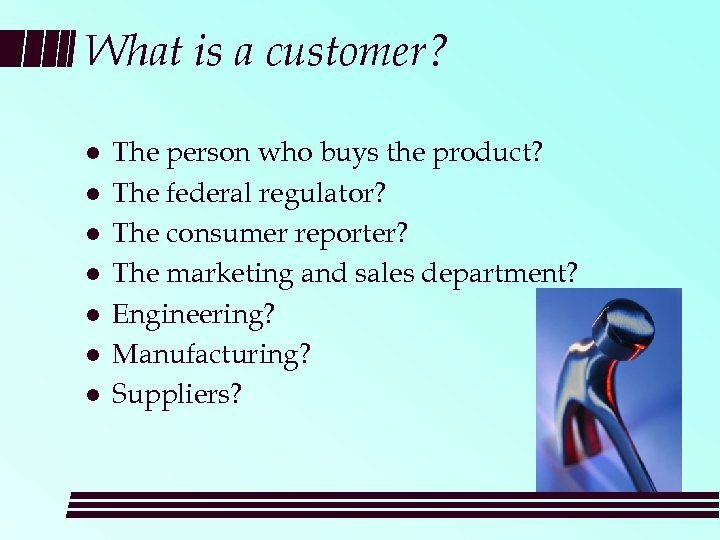 What is a customer? 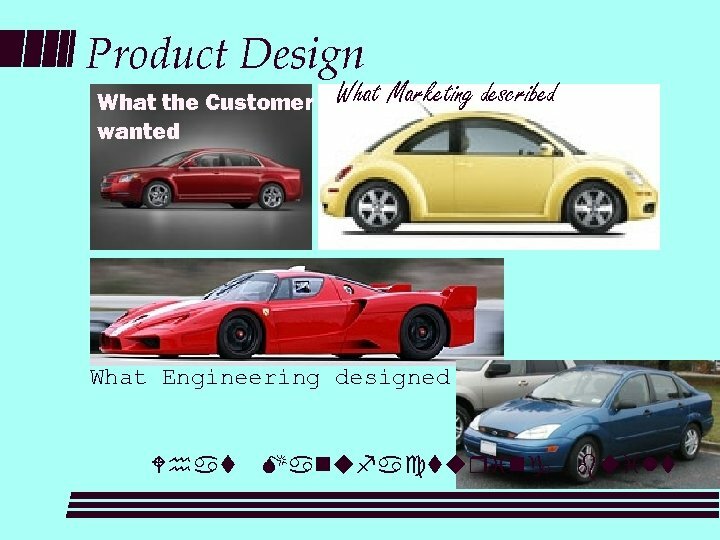 l l l l The person who buys the product? 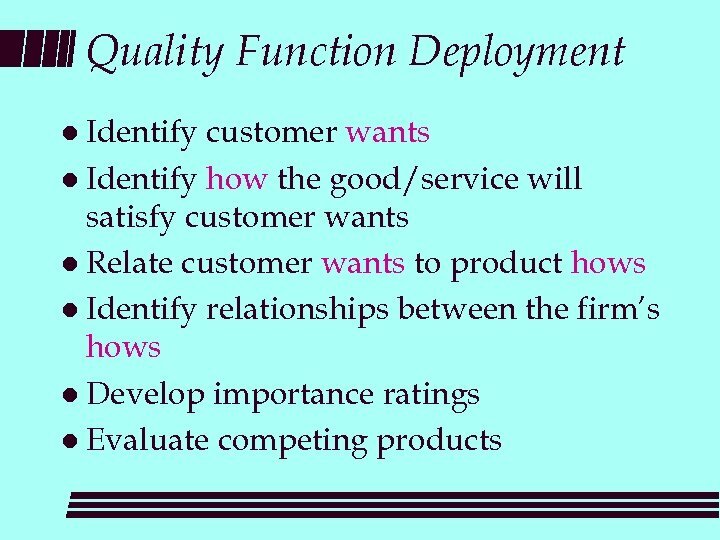 The federal regulator? 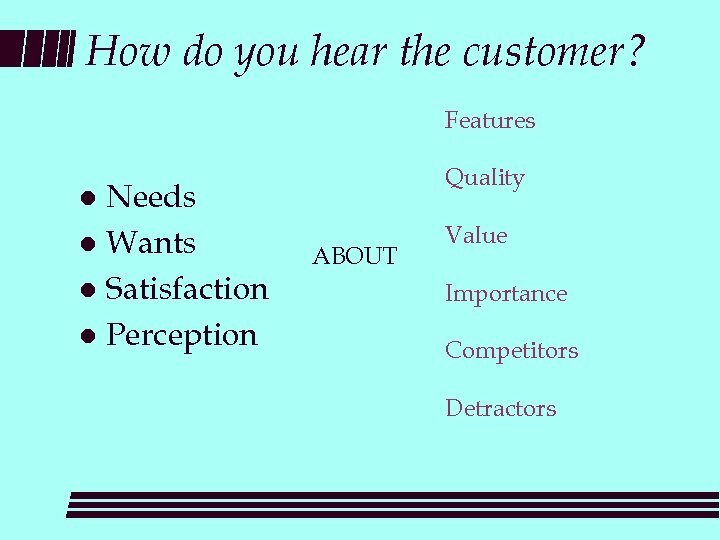 The consumer reporter? 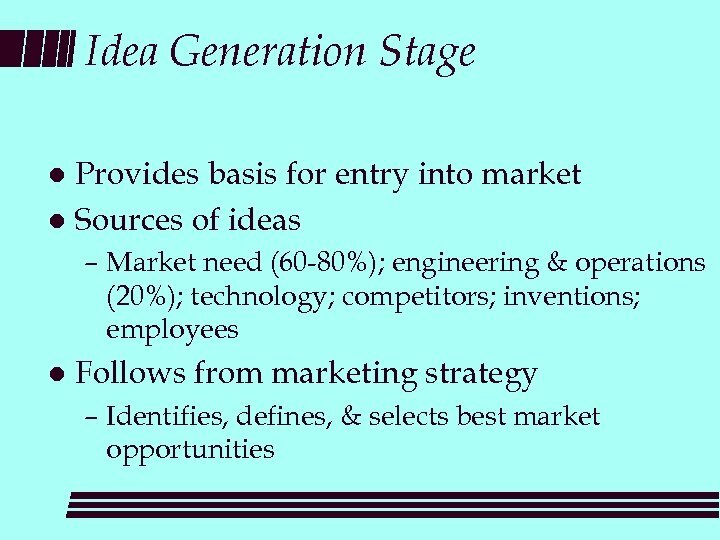 The marketing and sales department? 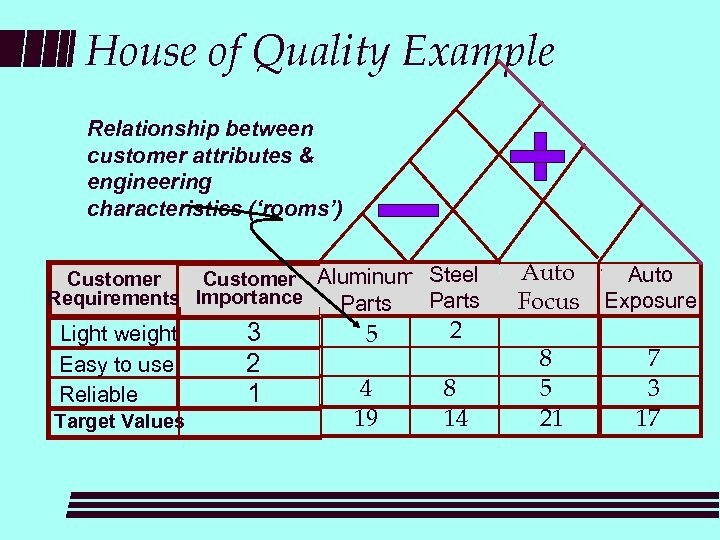 Engineering? 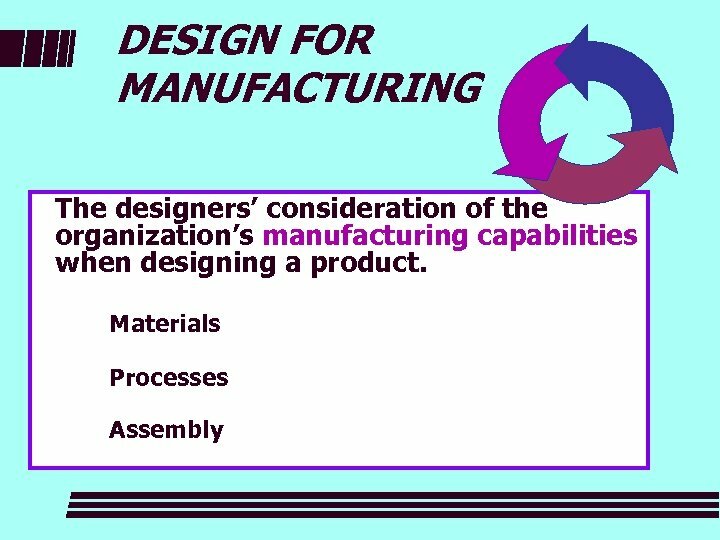 Manufacturing? 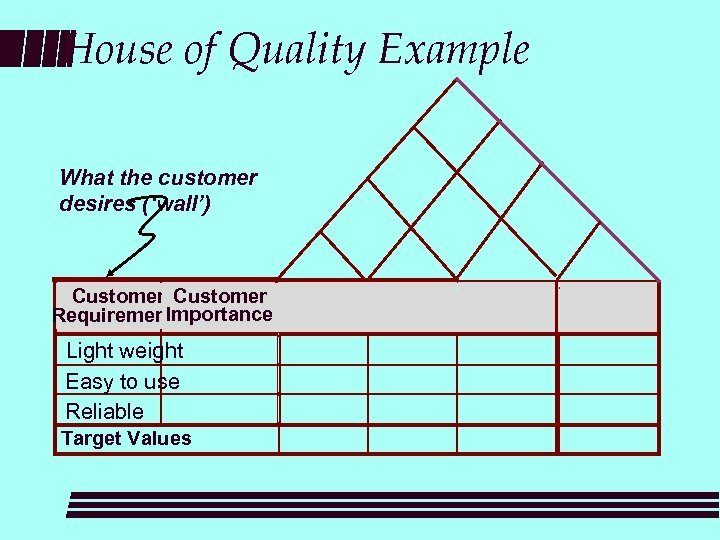 Suppliers? 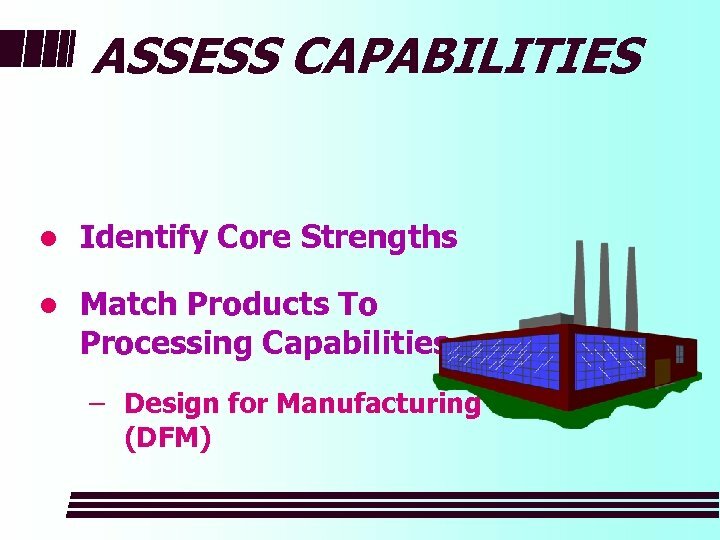 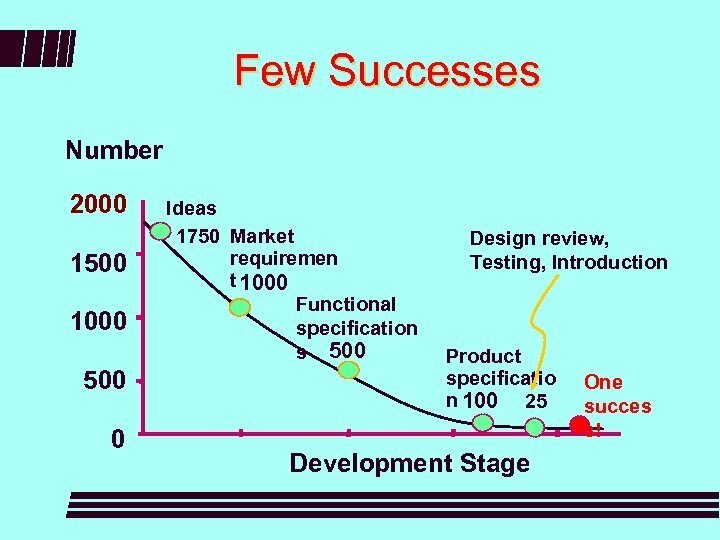 Few Successes Number 2000 1500 1000 500 0 Ideas 1750 Market requiremen t 1000 Functional specification s 500 Design review, Testing, Introduction Product specificatio n 100 25 Development Stage One succes s! 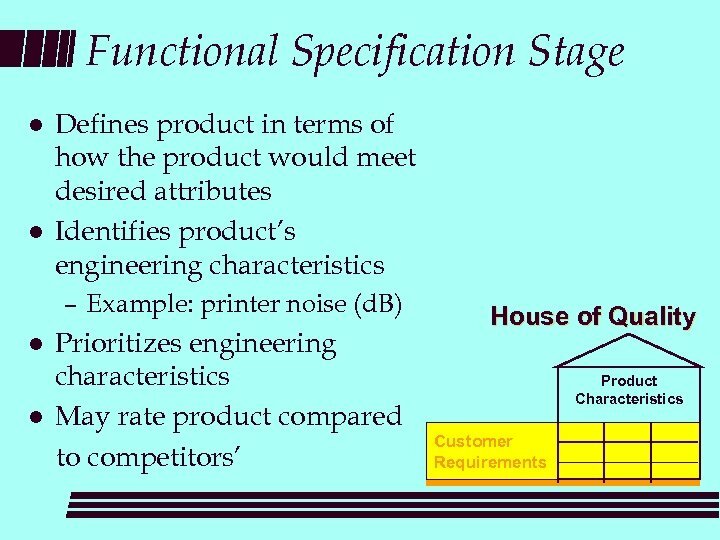 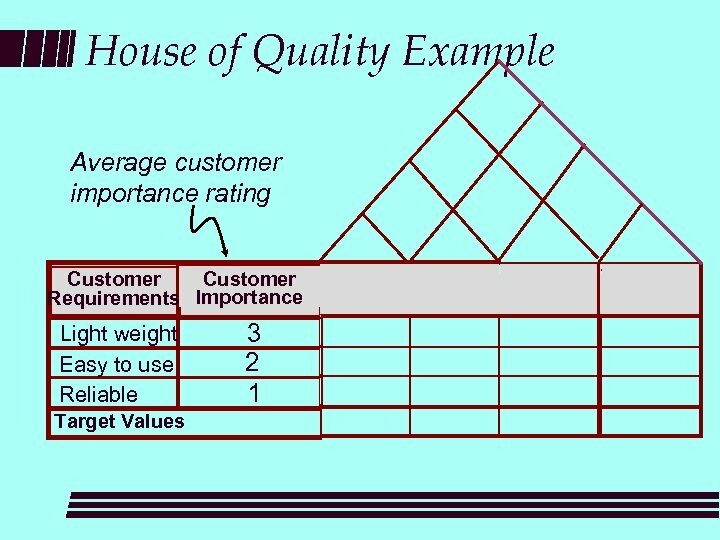 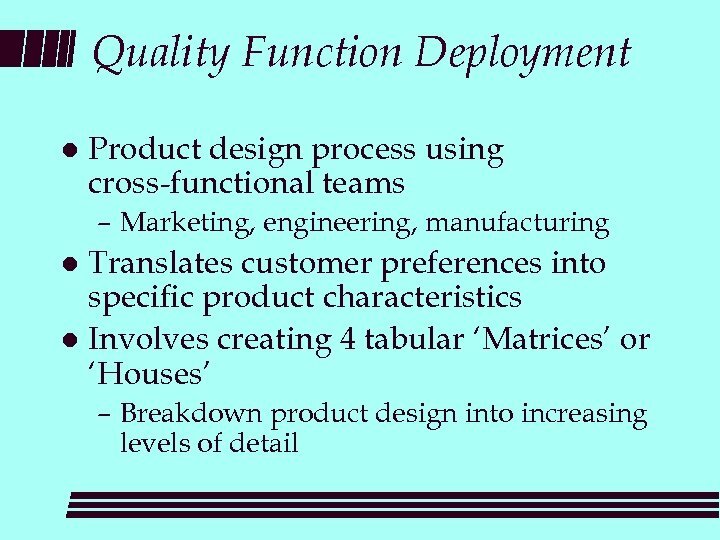 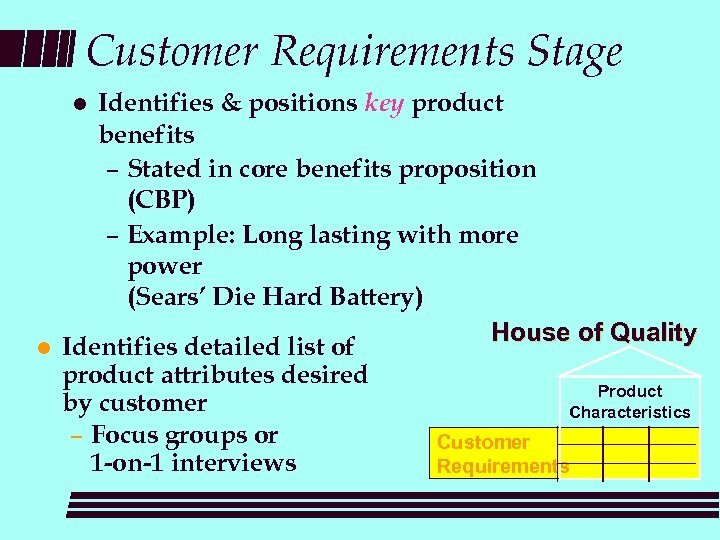 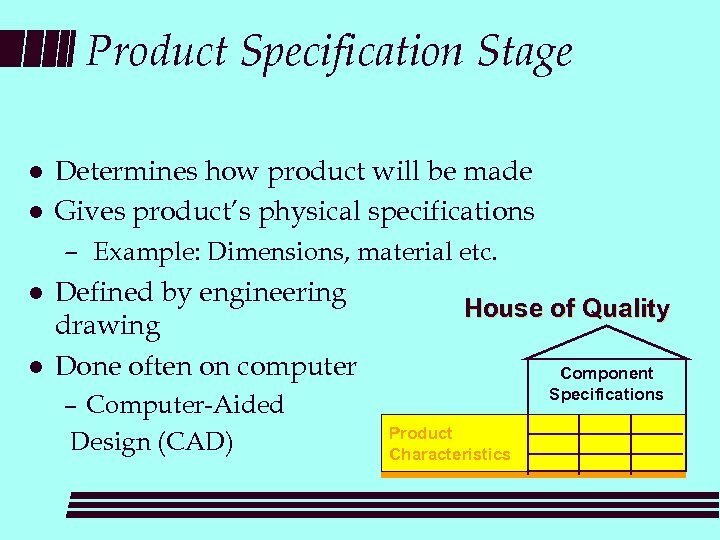 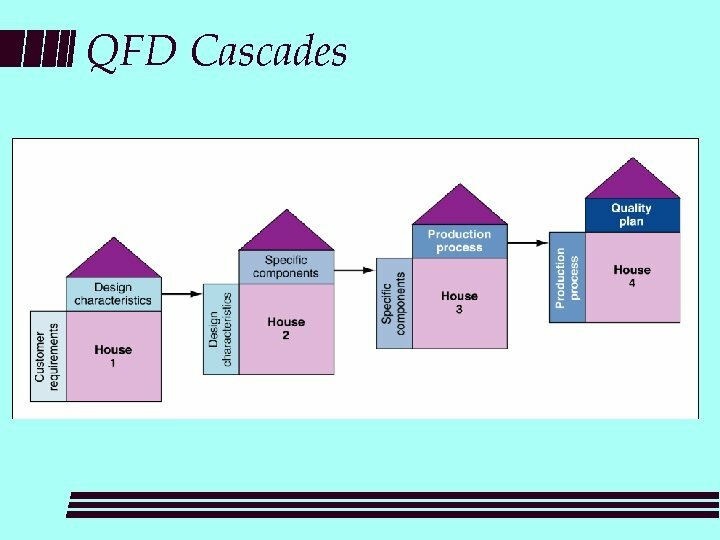 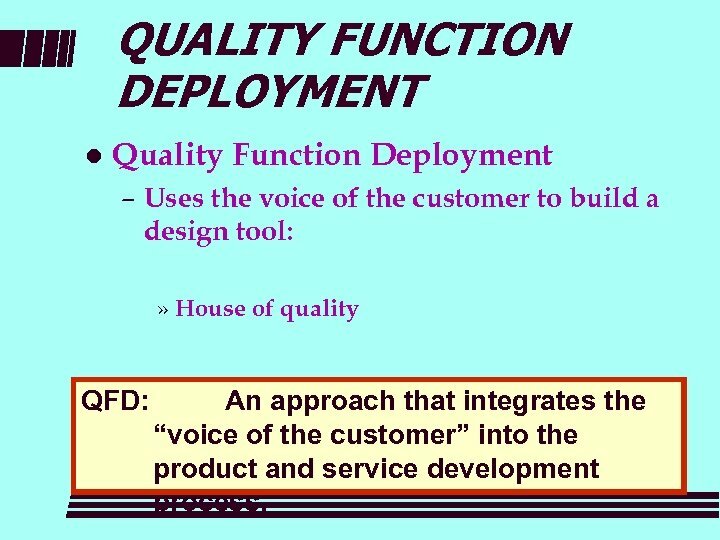 QUALITY FUNCTION DEPLOYMENT l Quality Function Deployment – Uses the voice of the customer to build a design tool: » House of quality QFD: An approach that integrates the “voice of the customer” into the product and service development process. 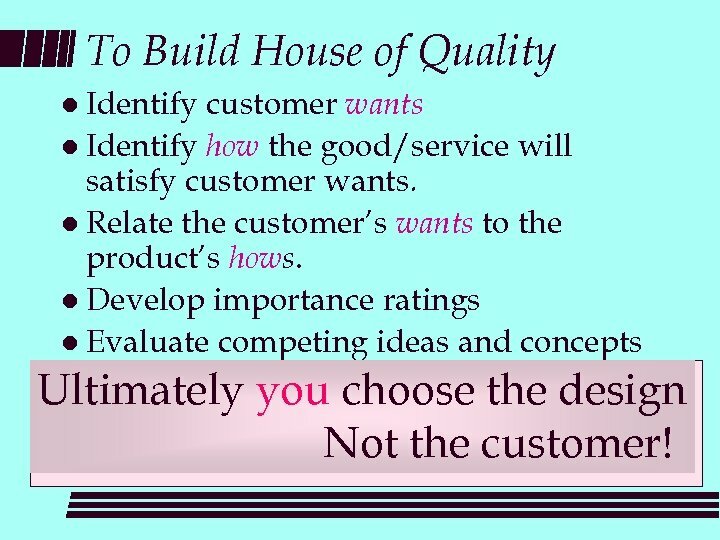 To Build House of Quality l Identify customer wants l Identify how the good/service will satisfy customer wants. 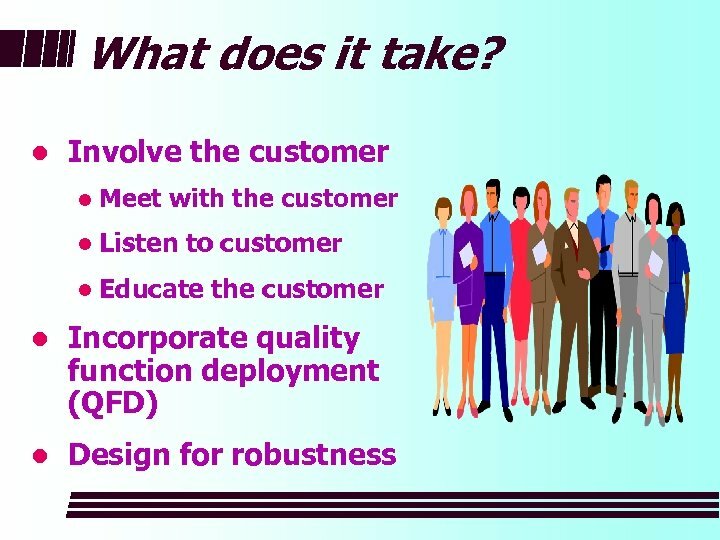 l Relate the customer’s wants to the product’s hows. 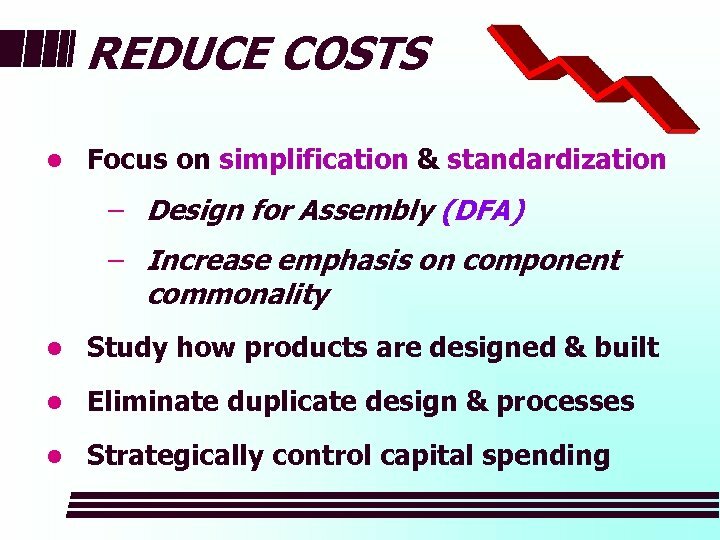 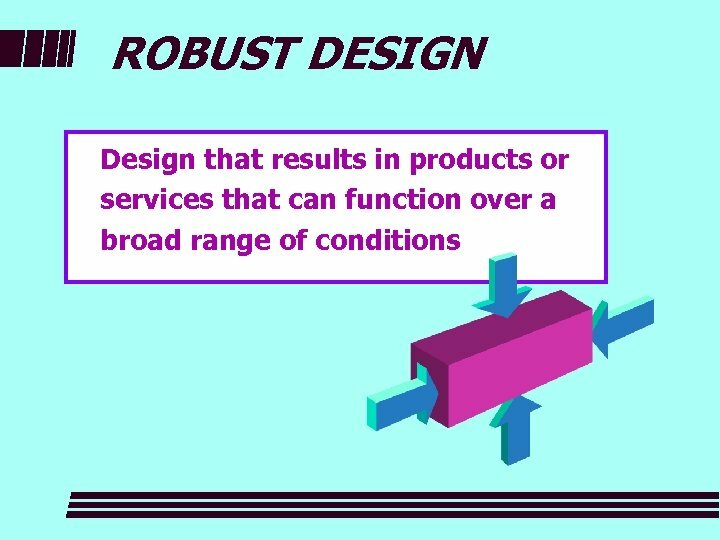 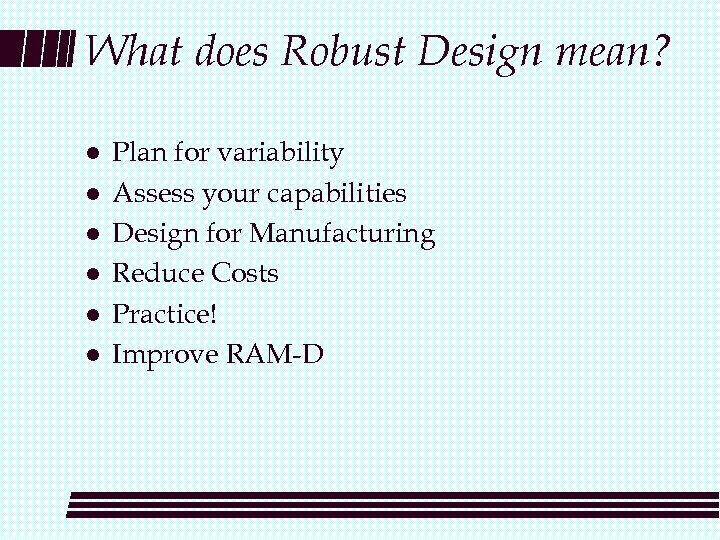 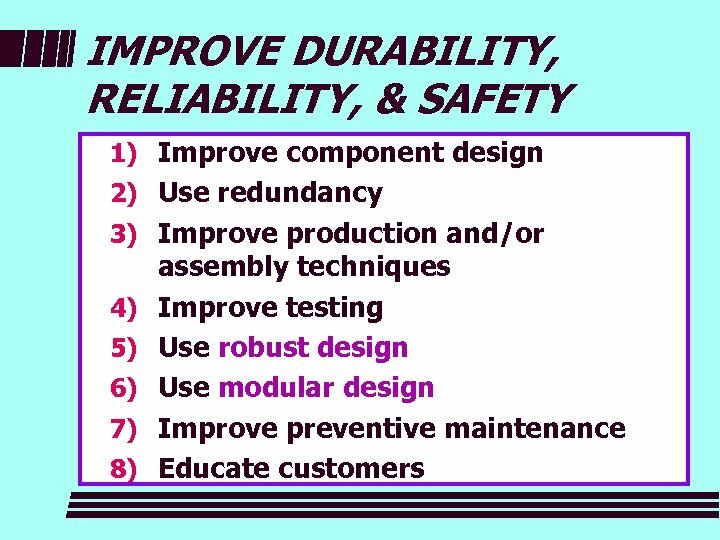 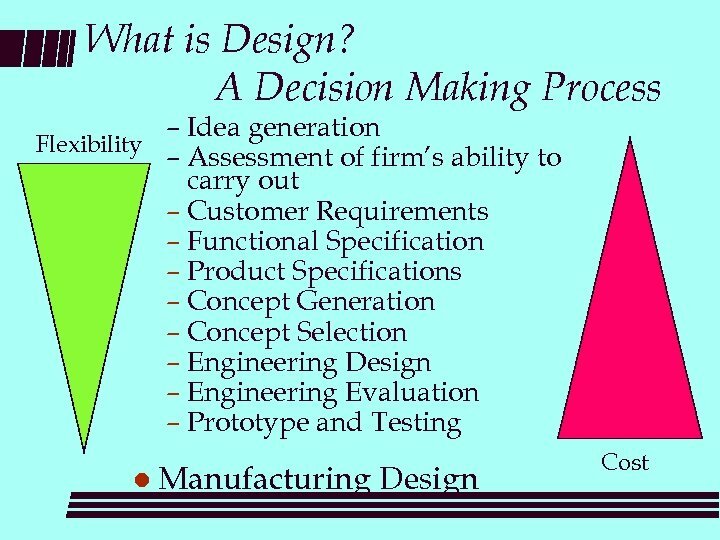 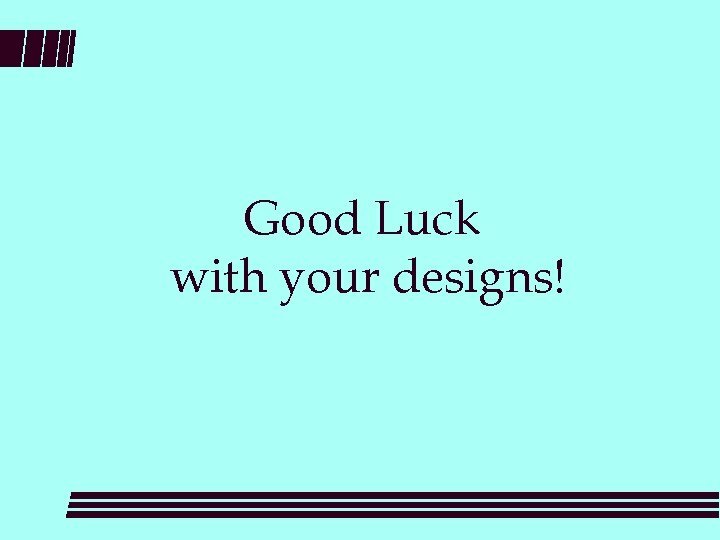 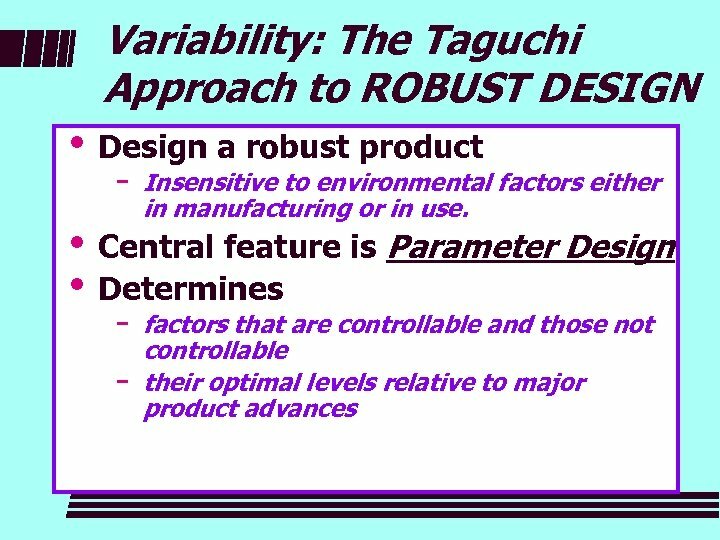 l Develop importance ratings l Evaluate competing ideas and concepts Ultimately you choose the design Not the customer! 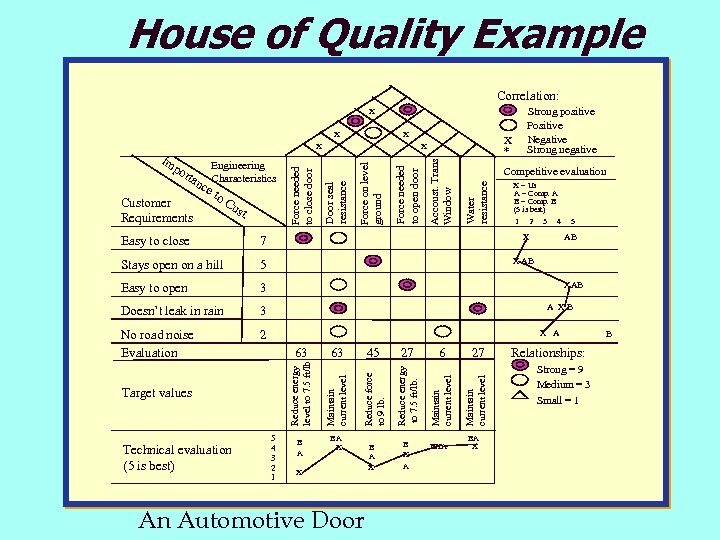 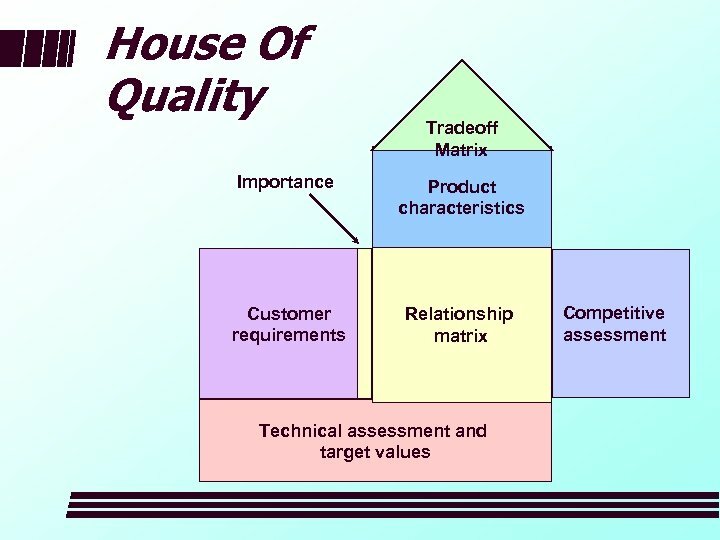 House of Quality Example You’ve been assigned temporarily to a QFD team. 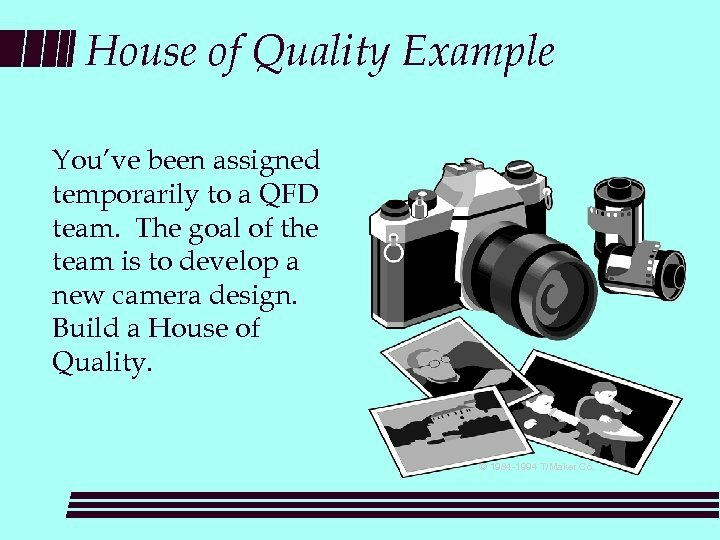 The goal of the team is to develop a new camera design. 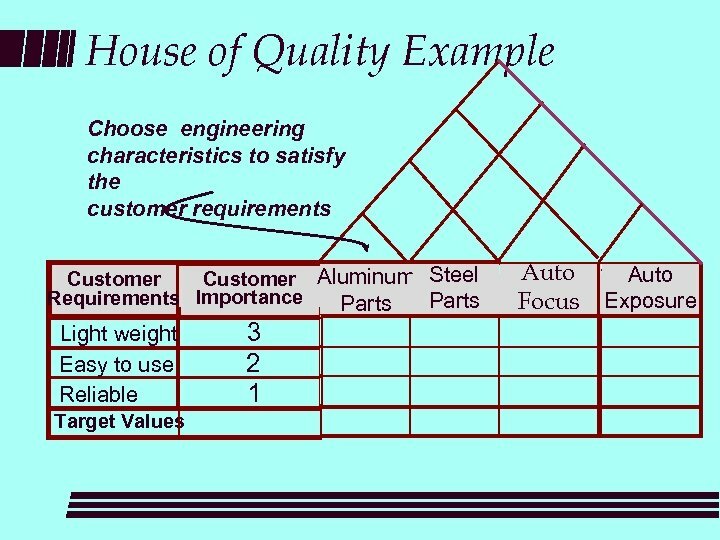 Build a House of Quality. 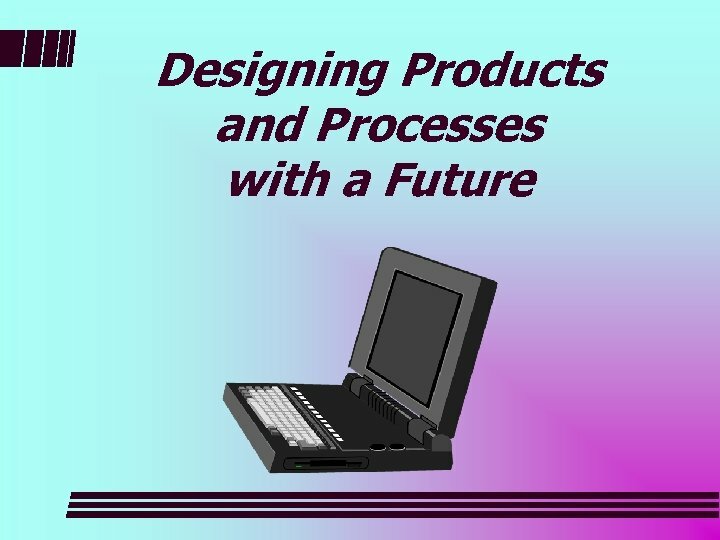 © 1984 -1994 T/Maker Co.